I'm always attracted to the weird and wonderful. Whether its a bizarre concoction on a menu, or supporting a football team without any hope of success, there's a certain compulsion to cheer on the underdog. This trait can apply to whisky as well, and when Cadenhead's announced a Canadian whisky, distilled using Indian Corn, well who could resist? In reality what we have here is an incredibly odd Canadian whisky that is 31 years old; pretty extreme maturation for the Canadian market. This Potter Distilling Company release heralds from Kelowna, British Columbia. 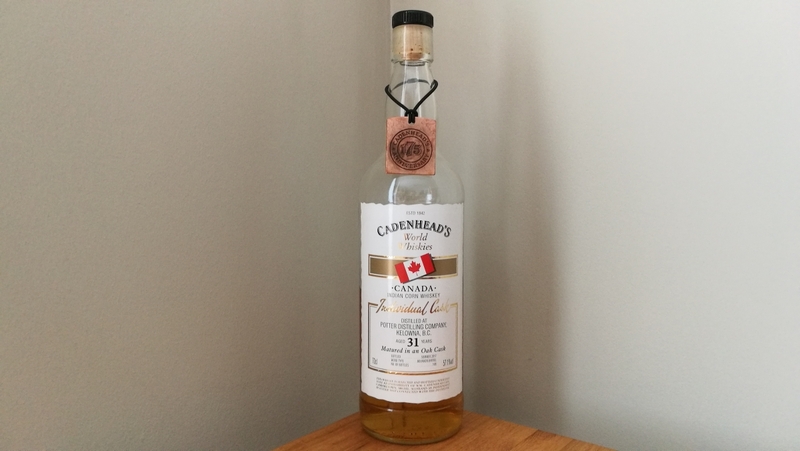 Cadenheads are widely known for their Scottish releases but have engaged in foreign whiskies in recent times. Several of these are American bourbons that spark great demand and the chase to flip a bottle at auction. 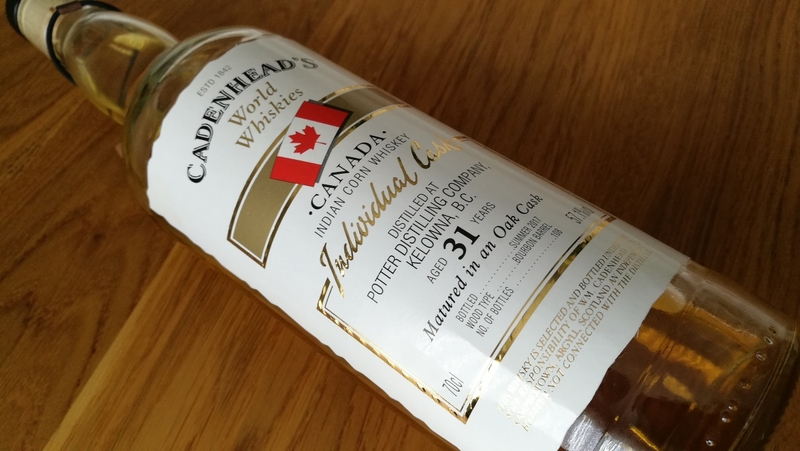 In comparison, Canadian whisky doesn’t enjoy such compulsive fan fever, despite a recent Bible award, but this hasn’t stopped Cadenheads from bottling now and again casks from Potter’s that were distilled using Indian corn, which I'll come back to. Stretching back several years, Cadenheads must have bought a shipment of these casks as releases have been 11, 15, 24, 26 and now an incredible 31 years old. Potters Distilling is now owned by Highwood Distillers who have various brands including the Centennial Spiced Canadian rye whisky, Highwood Canadian Rye and a Century Reserve 21-year-old. Highwood acquired Potters in 2005, which at the time was British Columbia’s only distillery. Potters itself was established in 1958 by Ernie Potter in the town of Langley and initially it specialised in producing liqueurs before moving into the realm of spirits that included the Century and Potters brands. The distillery was acquired in 1962 by a Captain Terry before taking it public just 5 years later. Then in 1990, production switched to a new site at Kelowna until 2006, when it moved to its current location of High River that allowed more expansion including warehousing. Yes, the move came just under a year after the acquisition of the company and the deal did include all maturing stock. The Kelowna facility was acquired by Andres Wines Limited. So what we have here on paper is a lost whisky distillery. Indian corn is a type of maize that is also known by other names such as flint corn or calico corn. I'm not an expert on corn and had to do some research, which is part of the joy of putting these articles together. Flint corn historically was used by some distillers in Canada and America. Normally harvested in the autumn months for food. Of course, you'll be thinking as I did, that verging on winter surely this crop would suffer in the field? Apparently not as due to a low water content it's very hardy and not prone to cold weather or freezing. The name may suggest a native American heritage but research highlights this strain is likely to have originated in China or South America. Yes, I know this is about whisky and not a historical lecture. Job done lets move onto the contents. This whisky was from a bourbon barrel, bottled in the summer of 2017, putting its distillation circa 1986. The cask yielded just 108 bottles at an impressive 57.1% strength, with an asking price of £130. Arguably a price too high for what is a whisky oddity, but as always I'm game. Nose: a very creamy vanilla fills the air undercut by a floral note moving into a light honey. A trace of wine gums, white chocolate and a buttery caramel. Freshly grated ginger, a creamy sweetcorn and with water fresh pencil shavings. Taste: dominated by butter and vanilla its a grain yes but not within the realm of Scottish grain with a rather thick and chewy texture. It's more mellow with an robust earthiness. A touch of menthol deep within and a herbal sage edge backed up by shortbread. Water tames the beast somewhat but these core characteristics remain resolute. Overall: this is an oddity on paper that carries through to the experience itself. I felt this was an Alice in Wonderland whisky where you just didn't know where you were going next and totally bizarre albeit in a good way.